Medical experts estimate that endometriosis affects 3-10% of women who are in their reproductive years. It can be excruciating and make it difficult for you to become pregnant. With her expertise in minimally invasive surgery and endometriosis treatment, Christine Wu, MD is highly sought after by women who struggle with endometriosis. Book your appointment at her Philadelphia-based practice by calling the office or by using the online booking feature. Endometriosis is a condition in which the inner lining of your uterus — called the endometrium — starts growing on the outside of your uterus. The tissue growing outside your uterus thickens, breaks down, and sheds during your regular monthly menstrual cycle. Unlike the tissue inside your uterus, the tissue outside your uterus has nowhere to go. Not only does this become incredibly painful as abnormal tissue growth builds up, it can also affect your ovaries and fallopian tubes (which may affect your fertility). While rare, endometriosis may spread to other areas of your body. While these symptoms most commonly surface during your period, you can certainly experience them anytime throughout your cycle. While the precise cause is unknown, there are several theories. One theory suggests that blood with endometrial cells flows through the fallopian tubes and into the pelvic cavity. These endometrial cells then attach to the outside of the uterus and continue to grow as they usually would inside the uterus. Surgery may also cause endometriosis. If, for example, you’ve had a Cesarean section, endometrial cells could attach to the incision in your stomach. Another explanation is that hormones can transform cells into endometrial cells. Another proposes that cells that line the inside of the uterus travel through the bloodstream and land elsewhere in the body. Your endometriosis treatment depends on the severity of your symptoms and whether or not the condition is affecting your fertility. Dr. Wu typically starts with conservative treatments, including birth control pills, hormone medications, or non-steroidal anti-inflammatory medications. If you’re not responding to conservative methods, though, you may have to consider surgery. 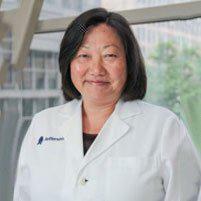 Dr. Wu is a specialist in minimally invasive surgery to treat endometriosis. During a laparoscopic procedure — which involves a specialized camera and advanced surgical tools — she can remove the abnormal tissue and surgically burn any lingering lesions. This type of surgery is beneficial if you want to preserve your fertility. If you’re not planning on getting pregnant, you could benefit from endometrial ablation. This procedure destroys a thin layer of the lining of the uterus. If you become pregnant after endometrial ablation, your risk of miscarriage and other problems dramatically increases. Before living another day with endometriosis pain and discomfort, schedule an evaluation with Dr. Wu. Book either online or over the phone.